With freezing temperatures and snow starting to fall in some cities, it's beginning to feel like winter already. But we still have a month of fall left to enjoy all of our favorite autumn eats (pumpkin spice, anyone?) and stock up on snacks that will keep us feeling cozy as the season turns. 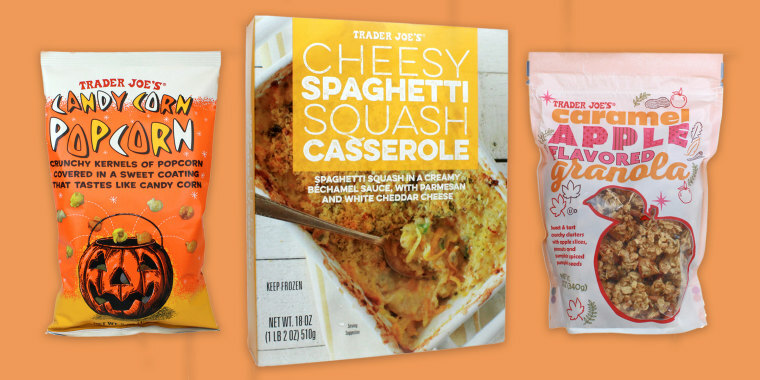 This year, in addition to bringing back popular fall treats like Pumpkin Joe-Joe's and Honey Roasted Pumpkin Ravioli, Trader Joe's introduced a bunch of new fall-themed products — and many of them are absolutely scrumptious. Here are 16 fall foods at Trader Joe's to try — including items like Candy Cane Popcorn and Apple Caramel Slab Pie. This new granola contains a blend of oats, dried apples and peanuts. Since no fall breakfast is complete without a little pumpkin spice, there are also pumpkin-spiced pumpkin seeds. It seems like it's a good topping for TJ's popular plain yogurt or, because it's pretty high in sugar, save it for dessert! $3.49 for 12 ounces. Halloween starts now with this new candy corn-flavored popcorn. It's a pretty sure thing that it's going to be more popular than candy corn pizza — yes, that's a thing and it's not great. The crunchy snack would probably make a pretty sweet base for popcorn balls too. $1.99 for 5 ounces. This new frozen casserole contains spaghetti squash in a béchamel sauce with Parmesan and cheddar cheeses. It would make a nice side dish for roast chicken or a last-minute nobody-has-to-know-it's-not-homemade Thanksgiving side. $4.99 for 18 ounces. The latest toaster pastry flavor makes the TODAY Food team dream of skipping right over fall to the snowy days of winter. It might not be the healthiest breakfast treat, but it could be an awesome dessert ... maybe with a scoop of vanilla ice cream?! $2.99. Trader Joe's Cookie Butter is a longtime TODAY Food team favorite. This new dessert-inspired spread sounds like it's a similar idea, but it has a marmalade-like consistency. The company suggested trying it on toast and baked goods like scones, muffins and cake. It also recommended using it as a sweet glaze for pork tenderloin, which is intriguing. $2.99 for 10 ounces. People went crazy for cauliflower pizza crust, so this butternut squash version is an interesting alternative. In addition to adding sauce and cheese, true butternut squash lovers may consider topping it with sauteed butternut squash. Alas, everyone will have to wait until October to try the new veggie pizza crust. $4.29. Made with cinnamon-spiced apples and caramel, this new item is meant to be a dessert, but it seems like it could be decadent breakfast option, too. Warming it up in the oven sounds like a good idea so the caramel melts a bit. $6.99 for 22.93 ounces. Fall is all about soup. Tomato soup, pumpkin soup and butternut squash soup are some of the most popular soups of the season. This one combines all three. $3.99 for 25 ounces. This returning product is a spin on one of the most popular products at Trader Joe's: chocolate-dipped vanilla ice cream cones. In this fall edition, ginger cones are filled with pumpkin ice cream and dipped in a sweet white glaze. $2.99. There are so many creative ways to use pumpkin puree, both sweet and savory, so it's a good fall pantry item to stock up on. This pumpkin puree was voted as the top pumpkin product by TJ's shoppers in 2017. It's the key ingredient for pumpkin pie. It's also a healthy addition to oatmeal, pancakes and baked goods. $1.99 for 15 ounces. The treat consists of a pumpkin cookie with a pumpkin filling, for pretty much all the pumpkin-y goodness a person can get. This seasonal spin on the sandwich cookie has been so popular in past years that it's back for its fifth fall run. $1.99 for 10.5 ounces. The TODAY Food team is pretty obsessed with several cheeses at TJ's, like Unexpected Cheddar and the Spanish cheese tapas sampler. The cheeses are yummy on their own, but these returning savory and sweet crackers are a good base for them too. $3.99. Making bread and muffins aren't hard per se, but it usually involves a bunch of ingredients. This mix is pretty much a no-brainer. It only requires eggs, oil and water. $2.99. TJ's has a plethora of delicious ravioli flavors, like the arugula and Parmigiano-Reggiano version. These ravioli filled with the seasonal gourd are making a comeback this fall and the TODAY Food team likes to serve them with an easy brown butter sauce. $3.49. Pumpkin spice mania shows no signs of slowing down. Although pumpkin spice isn't for everyone, people who love it can add the flavor to everything they eat and drink with this blend. $1.99 for 1.8 ounces. Another pumpkin item that returned this fall is this creamy dessert that's swirled with pumpkin puree. It's a good treat to serve while entertaining this fall for Sunday football, Halloween or Thanksgiving. There's no judgement for indulging on a weeknight either. $6.99 for 30 ounces. OK, so it's not actually edible, but this new candle which features the scent of one of America's favorite apples is a great way to get in the spirit of the season. $3.99.